At its worst, ‘fusion food’ can be a lazy phrase used by restaurants to describe a menu which tries to conquer several different cuisines while mastering none. As such, there is always a certain trepidation when visiting a restaurant which claims to serve fusion cuisine. Not so, at Aji. 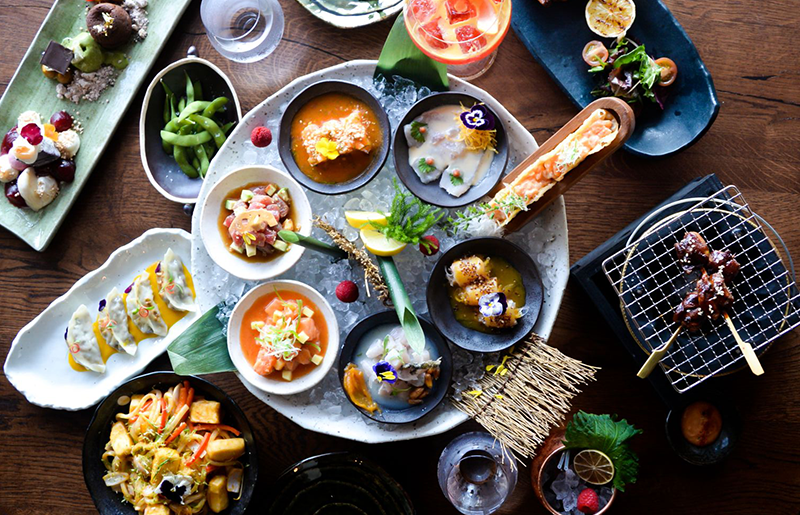 The restaurant serves Nikkei food – a Peruvian-Japanese mash up, which has been honed by South Americans since the first influx of Japanese migrants in the 19th century, and reflected in the thoughtful and delicious menu on offer at the restaurant. Although there are some meat and vegetarian dishes available, the restaurant’s focus is very much on seafood. The is superb range of sashimi, maki and nigiri, packed full of delicious, fresh salmon, shrimp, eel, tuna and plenty of other flavours. Be sure to try the black cod sticky rice with mushrooms and truffle and the ebi teppan (prawns with Japanese butter, spices and coriander) from the Nikkei grill. The menu costs around AED 500 for two people dining, although there are regular offers on, including five free drinks and 50% off food for women each Monday after 8pm and two for one options throughout the week via The Entertainer app. The service can be a little confusing – different waiting staff have different roles and orders placed with the wrong member of staff can result in drinks not arriving at the table. That said, the team were enthusiastic and quick to correct any issues that arose. At first glance, Aji seems like a concept that shouldn’t work: a large, high-end, dimly lit restaurant on a beachfront, competing with a more relaxed beach grill outlet andgastro-pub. Testament to the strength of the menu, the restaurant is regularly busy with people. There’s plenty of outdoor dining space next to the beach with fantastic views of the Palm and Burj Al Arab during the Winter months. During the Summer, the interior doesn’t disappoint: the restaurant is covered in graffiti-style art, and a mish-mash of Japanese and Peruvian statement pieces. For the more daring customers, be sure to stop by at their bar first to try out their unusual flavour concoctions made by their in-house mixologists. Details: for more information, visit Aji. If you enjoyed this, you may like this review on the Waka evening brunch.